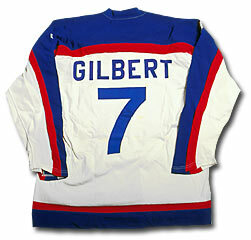 in the 1976-77 season, his second last NHL campaign. 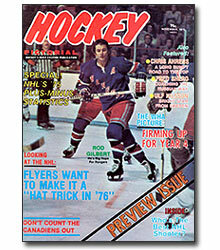 Even after playing 15 years in the NHL, Rod maintained an incredible high profile as demonstrated with him earning cover status on this November 1975 Hockey Pictorial magazine. 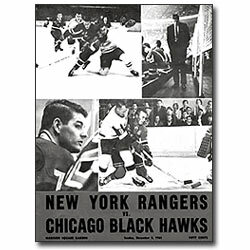 A program from the Sunday, December 5th, 1965 game between the New York Rangers and the Chicago Black Hawks at Madison Square Garden. Gilbert is pictured on the bottom left. 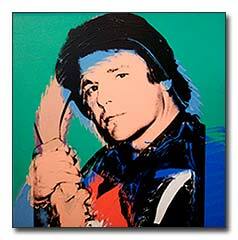 Two of Rod's milestone sticks. He used this Victoriaville stick (top) to record his 250th career NHL goal during the 1972-73 season, and used this Sherwood stick to score his 400th goal during the 1976-77 season. 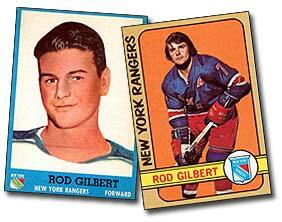 A pair of hockey cards from Gilbert's illustrious 18-year NHL career. On the left is a 1962-63 Topps card and on the right a 1972-73 O-Pee-Chee card.